Klaas Jacob Enns: church worker; born 2 November 1880 in Friedensdorf, Molotschna Mennonite Settlement, Ukraine to Jacob and Aganeta (Dück) Enns, the eldest of six sons. In 1904 he was baptized and accepted into the Mennonite Brethren Church. On 11 October 1907 he married Katharina Braun (1 February 1889, Konteniusfeld, Molotschna, South Russia – 6 July 1964, Clearbrook, British Columbia, Canada) in Kontentiusfeld, Molotchna. They settled in the Crimea. Ten children were born to this union, three of whom preceded Klaas in death. As other young Russian Mennonite men of his era, Klaas Enns satisfied his alternative service by a four-year stint working in the Vladimir Forest (Forsteidienst). In 1925 the Enns family immigrated to Canada, first settling in Sterling, Alberta. A few years later they pioneered in Coaldale, Alberta, the first Mennonite family in this community. Being a lay preacher, Klaas Enns rented a large farm where he began conducting Sunday worship services. With the arrival of other immigrants, including ministers and choir conductors, the Coaldale Mennonite Brethren (MB) Church was organized on 23 May 1926 on the Lathrop farm. By 1931 Klass was experiencing health problems. His personal circumstances together with the impact of the economic recession that was engulfing Canada, prompted the Enns family to make British Columbia their new home. The family first settled in Abbotsford where Klaas became involved in the fledgling South Abbotsford MB Church. Soon after, Klaas purchased a dairy farm in Murrayville, which became the source of livelihood for the family. Since Klaas was frequently away from home, his children were left with much of the farm work, while his wife often entertained guests and mission workers in their home. Klaas embraced a strong commitment to evangelism and church growth. With his limited command of the English language, he nevertheless spoke to his neighbours about his Christian faith. Along with Abe J. Stobbe, he is credited with being the initiator of the West Coast Children’s Mission (WCCM), and along with Peter Ewert, among its enthusiastic promoters. 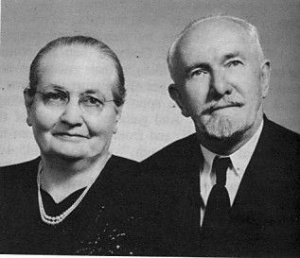 Among the teachers he recruited for the ministry of WCCM were Elsie Peters, Henry Warkentin, and John Dyck, who later was killed in an aeroplane accident while serving as a Mennonite Brethren missionary in Columbia. After the death of his adult son, Klaas sold the farm. In 1943 the family moved to St. Catharines, Ontario to assist in the beginnings of the St. Catharines Mennonite Brethren Church, which began meeting in a small room where the local daily newspaper The Standard was being published. Klaas Enns by now walking with the support of a cane, would make his way up down the city streets, inviting people he met to attend services in the newly organized church. In 1951 the Enns family once again moved to Abbotsford, where Klaas died on 12 November 1955. Klaas Enns was a visionary, encourager and motivator. He influenced many people to become followers of Jesus Christ. GRANDMA (The Genealogical Registry and Database of Mennonite Ancestry) Database, 6.02 ed. Fresno, CA: California Mennonite Historical Society, 2010: #663645. Mennonitische Rundschau (21 December 1955): 1; (23 September 1964). Penner, Peter. Reaching the Otherwise Unreached: An Historical Account of the West Coast Children’s Mission of B.C. Clearbrook, BC: West Coast Children’s Mission of British Columbia, . Siebert, Nita and Helen Martens. "Enns, Klaas (1880-1955)." Global Anabaptist Mennonite Encyclopedia Online. February 2010. Web. 19 Apr 2019. http://gameo.org/index.php?title=Enns,_Klaas_(1880-1955)&oldid=156035. Siebert, Nita and Helen Martens. (February 2010). Enns, Klaas (1880-1955). Global Anabaptist Mennonite Encyclopedia Online. Retrieved 19 April 2019, from http://gameo.org/index.php?title=Enns,_Klaas_(1880-1955)&oldid=156035. This page was last modified on 9 December 2017, at 05:17.